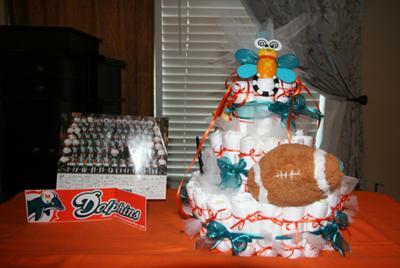 This is the place to come to Get and Give baby shower diaper cake ideas, pictures and tips. 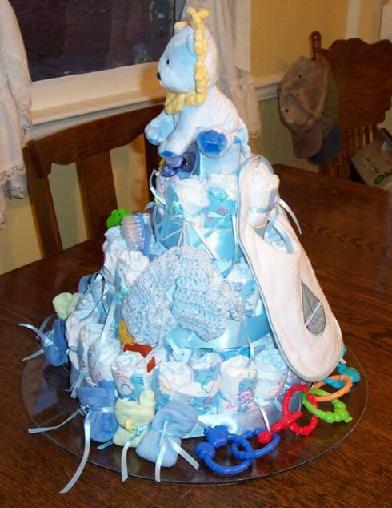 My creativity is only so much, but combined with all the fabulous ideas from all of you, we can make this the cutest, most comprehensive & most helpful baby shower cake resource on the web! 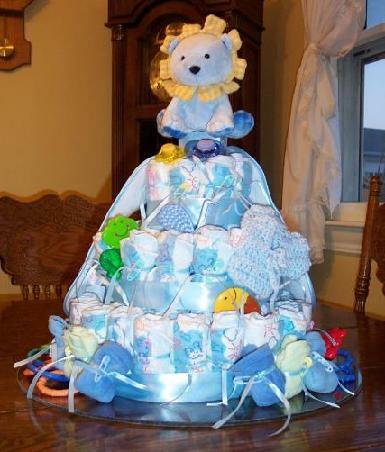 Submit your baby shower diaper cake ideas and your diaper cake will last forever, right here! 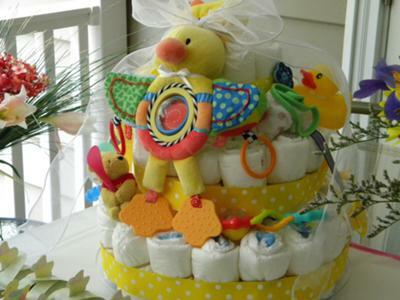 It's a way to share ideas with others and show off your diaper cake & baby shower ideas to your friends & family. 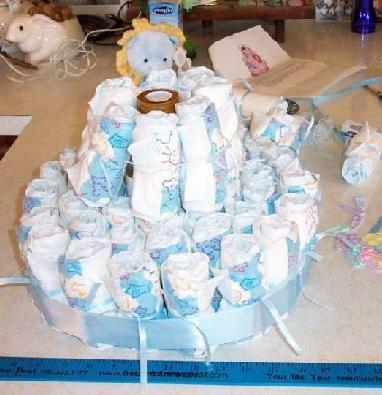 How do you make the perfect diaper cake? Just take a look below! 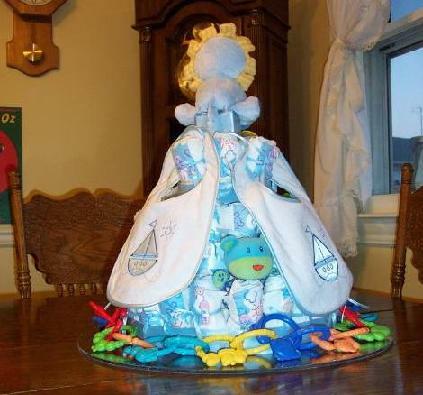 This diaper cake is AHHH-MAZING! 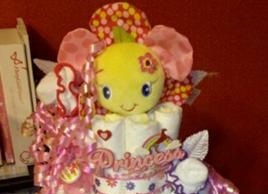 The bright colors and flower accents are divine. 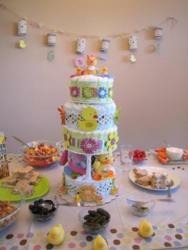 And it looks so cute with the yellow ducky and polka dot decor! Love it. So classy! I followed the directions on the website. 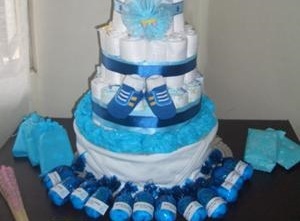 I ended up needing more than 60 diapers, because the bottle of Pedialyte was more rounded than a bottle of lotion. I chose Pedialyte, because the new moms usually get so much lotion, (and who wants to run to the store in the middle of the night, the first time the little one is sick?) 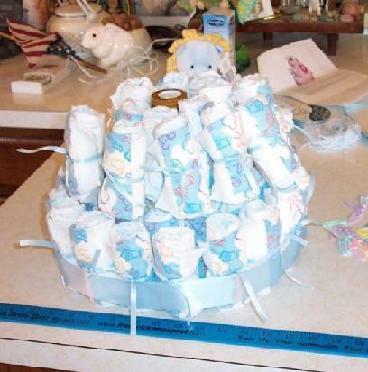 I tied yarn around some of the inner layer diapers, and used rubber bands on others. 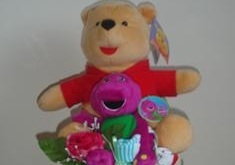 My stuffed animal for the top was a blue lion. 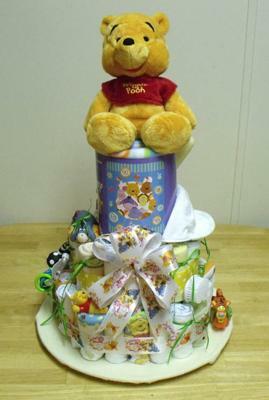 I "garnished" the cake with all the little add-ons, and roped the links around the bottom. 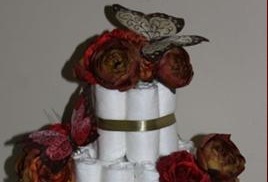 I folded the 6 washcloths, and used those as garnish on the bottom also. A friend made me a 22" piece of plexiglass to use as a "plate". 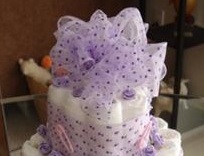 I also made one pair of crocheted baby booties to put on the cake. 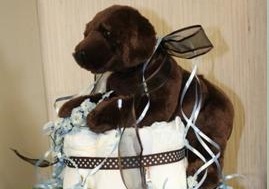 The total cost was $51.82 for this cake. The cost could be kept lower, using a smaller bottle for the core, and lots less garnishes. 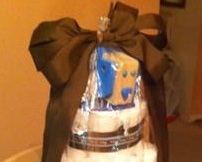 I tucked the party favors pins into the tie ribbons on some of the outer diapers. It was a lot of fun to make!! Thanks Chris! 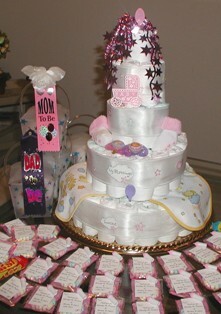 What a beautiful baby shower diaper cake, and your breakdown of the price of each "ingredient" is EXTREMELY helpful!!! 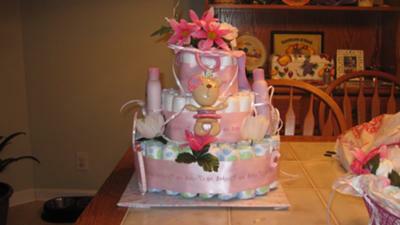 "I happened upon your site while looking for baby shower ideas for a friend. 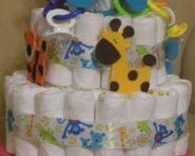 I loved the diaper cake idea and was so proud with the result that I took a photo and attached it to this email. Thank you so very much for the great idea and instructions! -1 Lg. 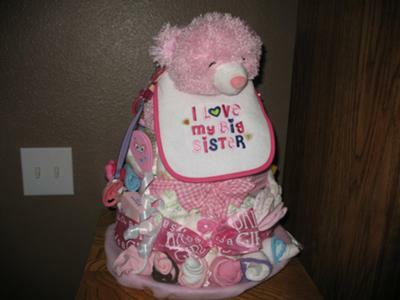 Bottle of Baby Lotion (also for 1st & 2nd tier...I put both bottles together on the bottom and surrounded them with the diapers). 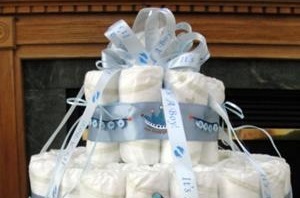 -71 Diapers (40 small Diapers for Newborns & 31 larger Diapers for 12 lbs. and up). 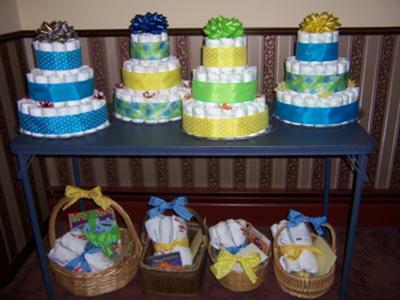 In this way you can "mold" the cake depending on how thick of a roll you need, etc...On the 1st (bottom) tier I used both sizes of diaper and made 3 rows around the bottles of baby wash and baby lotion. 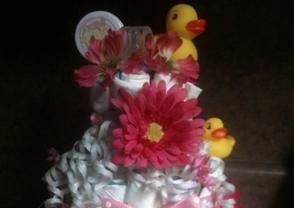 For the 2nd tier I used both sizes again forming 2 rows around the rest of the bottles of wash and lotion. 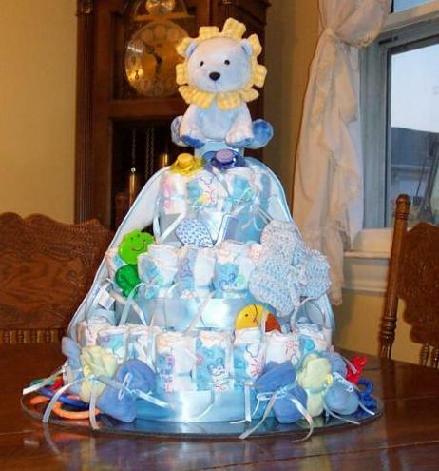 On the 3rd tier I made 1 row around the baby bottle using only the larger diapers. 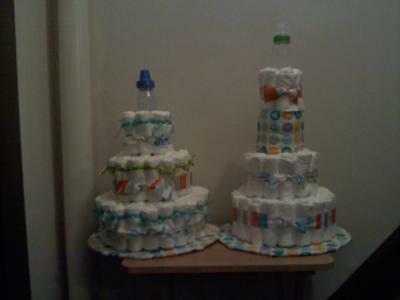 On the 4th tier I made 1 row around the remainder of the bottle, but only used the small diapers. 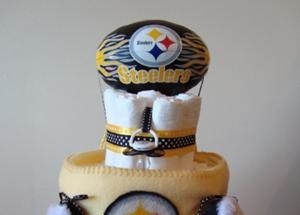 A small diaper made up my 5th tier (I just kind of wedged it into the middle of the 4th tier). How I tied Ea. 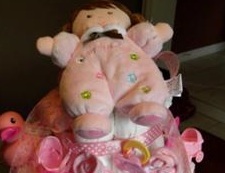 Diaper: I opened ea. 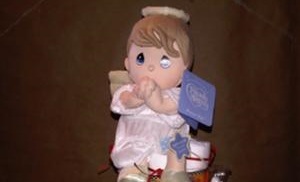 one up and started rolling at the end that would make up the front of the diaper if it were actually on a baby. I'd roll it up like a cinnamon roll and then secure in the middle with a rubber band. I thought I'd share my own recipe." Thanks Kenitha! It is DARLING!!! 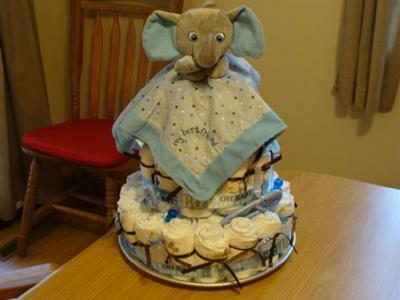 These pictures of baby shower cakes that others have made will give you some great ideas to make your baby shower diaper cake. 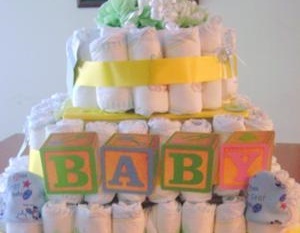 And with a little creativity & a few of these baby shower cake ideas, you can make a unique diaper cake for that special soon-to-be mom in your life. 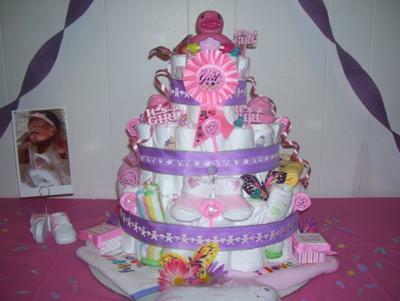 But, before you give it to her, send me a picture of it to share your diaper cake with everyone!